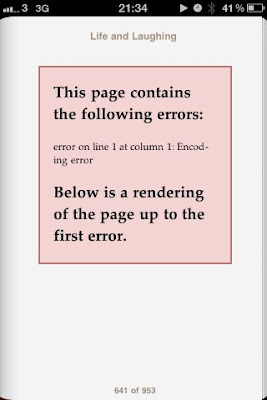 @fellfromatree tweets: Anyone seen this iBooks error before?? Any idea how to solve it? I'm getting it too and it's in all my books. Updated system & synced again but it's still there. Can anyone help? Download Version 1.5 of reader. All my problems (with multiple books) even the inability to view pictures went away! Thanks, I deleted the iBooks app and re-installed. It worked, books are there and I can read again! This was the easiest solution!